The FIFA World Cup 2018 in Russia has just finished, the big event was held from June 14 to July 15, 2018, various victory parties have been celebrated and France became the world champion for the second. 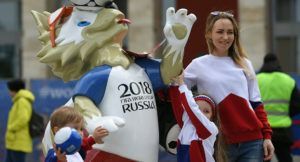 In spite of the fact that FIFA World Cup 2018 party has passed but there are still many things that are interesting enough to be talked, how many things Russian do to celebrate the incoming of FIFA world cup 2018 in Russia. Amazingly. How FIFA World Cup 2018 held in Russia can be an example of the next reference, as we know before, some parties have doubted the implementation of FIFA World Cup 2018 will success in Russia, but amazingly, Russia gave the answer, Russia was doing it well. Here we talk about 5 things Russian do to celebrate the incoming of FIFA world cup 2018 in Russia. After propose to be host the World Cup, finally on December 2, 2010 FIFA decide Russia as the host of FIFA World Cup 2018. Russia in this case succeeded in defeating other countries that also submitted proposal as candidates for organizing FIFA World Cup event, there are Spain / Portugal and the Netherlands / Belgium, England, overall 11 countries that submitted to FIFA. The decision is based on the results of the FIFA executive committee meeting in Zurich, Switzerland. And the fact needs to be known that with this FIFA decision, Russia as the host of the FIFA World Cup 2018, means that this is the first time this football event held in Eastern Europe and the first time held in Russia. For various purposes related to the implementation of the FIFA World Cup 2018, Russia preparing USD 14 Billion, the value is fantastic. The funds are intended to fix various operating assets, including transportation infrastructure, stadium renovations and accommodation. Which is more than 50% of the cost is borne by the federal government. The most spending of the funds issued are for transportation infrastructure facilities USD 6.11 billion, for stadium renovation USD 3.45 billion and accommodation USD 680 million. The huge budget is poured for the stadium build and renovation. Russian Government took private investors to renovate and build many stadiums for the FIFA World Cup 2018. Here are stadiums that were renovated and built. Luzhniki Stadium in Moscow city, the stadium was founded in 1956. In 1980, when Russia held the Olympics, the stadium became the main stadium. In the event the 2018 world cup, the stadium is used for the implementation of the Final round between France vs Croatia. Kaliningrad Stadium in Kaliningrad city. Half of the cost of building this new stadium comes from the state budget. Built in 2015, the stadium is finished in 2018. Nizhny Novgorod Stadium in the city of Nizhniy Novgorod. It is a new stadium built in 2015 until 2018. This stadium is near the river, located at the confluence of the Volga and Oka rivers. It built next to Alexander Nevsky Cathedral, Nizhny Novgorod. Otkrytie Arena or Spartak Stadium in Moscow city. Conducted development in 2014, funding most by Leonid Fedun, club owner of Spartak Moscow. Fisht Stadium in the city of Sochi. . Conducted development from 2013 until 2016. Fisht Olympic Stadium was originally built for the Olympics and Paralympic in 2014, then used to play matches in FIFA World Cup 2018. Kazan Arena in Kazan city. Conducted development in 2013. The uniqueness of this stadium is have the largest outside screen in Europe, which extends along one stands stadium. Zenit Arena in St. Petersburg city. It is one of the stadiums whose construction has stalled and is delayed by up to 9 years, is one of the most expensive stadiums in the world, this own by Zenit St. Petersburg. Rostov Arena in Rostov city. The construction of the stadium begins in 2014 and completed in 2018. Mordovia Arena in the city of Saransk. Construction of the stadium began in 2010 and completed in 2018. In every World Cup event the security issue is the most highlighted issue, where for big event FIFA World Cup 2018,security to be the number 1 for guarantee, Russia do the preparation of the structured security. Security in the cities where the competition was held was tightened and improved. The police were stationed to guard while pacing every road, large and small. At the airports and underground stations, police, army, and Federal Security Service (FSB) forces continue to conduct surveillance. Well-trained dogs carried by the soldiers, soldier are equipped with combat weapons. In order to protect security of the FIFA World Cup 2018 stadiums. Russian Ministry of Defence, warfare electronic units will use Russia will use drone-prevention systems such as Zhitel and Svet-KU. For guarantees of supporters, an international football discrimination network in sport, FARE (Football Against Racism in Europe), also offers protection to supporters if there is a problem of racism and other social issues at the FIFA World Cup 2018. Being a host does not mean no burden for the Russian national football team, they are putting their host’s pride in winning the final round. Despite getting a direct ticket to play in the World Cup because as a host, Russia still prepares its national team well. Russia do friendly matches to face the FIFA World Cup 2018. Fact that we need to know, Russia is one of the countries with a good football culture. Europe’s top players come from the Red Bear country. The names are Mateja Kezman, Roman Pavlyuchenko, and Andrei Arshavin, certainly they are no stranger for soccer fans. Long time before, Russia also gave birth to legendary goalkeeper who later named as a name of the award for best goalkeeper, Lev Yashin. The fact is, Yashin was the first goalkeeper who win the best player or Ballon d’Or award in 1963. And now Russia national football team with the result of a friendly match before, the steadily advanced to the World Cup finals, although the previous year in the Confederation Cup failed in the group phase, we can see for the result Russia national team managed to qualify for the round of 8, but fall after being defeated by Croatian.